My Fellow Americans (and by that of course I mean you 53%’ers who aren’t home sitting on your fat, food-stamp-eatin' asses watching “Jerry Springer”). As you know, I am locked in a tight race with President Obama (Kenyan Tribal Leader in exile). The simple truth is, we both have a very different vision for America (Check this out…he actually cares about poor people!). He wants to “redistribute” wealth, taking more from you hard-working, salt-of-the-Earth Americans while I believe that, because “you built it,” (or “daddy” built it) you should keep it (C’mon, that’s your inheritance, not the government’s!). The economic recovery is a disaster (well, it’s actually pretty damned good…but I’m not gonna say that publicly!) I will fight for the middle-class (if by middle-class we mean those making around a quarter-mil?). I will protect and preserve Medicare (honestly, I can’t wait to dismantle that sucker!) And I will ensure that every American has a safety net (ok, you 47%’ers, you parasitical military vets and seniors, just because you served your country and paid taxes your whole life doesn’t mean you get a free ride just because you get old and sick. Get out of that wheelchair and get a damned job!). I will ensure that everyone who wants a college education will get it (even if they have to sell some stock to pay for it). And I will cut funding to Planned Parenthood (because as everyone knows, the surefire way to end unwanted and teen pregnancies is to abolish birth control…er…wait…don’t quote me on that one…I’m still trying to work this whole “Personhood” thing out…). On Foreign Policy, Obama and I also have major differences (that’s because he has great intellectual curiosity and I, well, I like cheese…). Take Iran for example (or is it Iraq…I always get those “Ira” states mixed up. Our new enemy’s the one with the “n,” right?). We’ll use military force if necessary to wipe out their nuclear-weapons facilities (just don’t count on my five strapping sons to fight that war…as they’ll be doing some other, more patriotic stuff like handing out “De-fund Planned Parenthood” flyers). Obama is a weak apologist (that is of course if killing and toppling bin-Laden, al-Zawahiri, al-Qaeda, Qadaffi and droning the snot out of Pakistani terrorists means “I’m sorry”) who cannot protect America (and I know what being tough is…you think it was easy during the Vietnam War being in Paris so far away from my Trust Fund?). So get out there and vote in November (unless of course you’re poor, black and Hispanic and are being disenfranchised by my party’s rapacious quest to enact Draconian voter ID laws that will prevent you from doing so). I'm currently part of the 53%, arent' we all going to move into the 47% if we live long enough? I have watched a lot of campaigns throughout the years and this is one of the worst I've seen. I honestly thought that after the RNC the national repub party would take over. 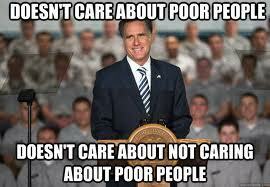 It is obvious that CEO Mitt is running his campaign and it sure shows. Keep it up Mitt. I am storming heaven for President Obama and the Dems. This is not just about Obama. We must work like hell to get the Senate and House Dems elected in November or our frustration levels will not change.